Blogging for Real Estate Professionals. More and more, realtors are looking for an edge in today's tough real estate market. Some have alerady turned to blogging and have enjoyed great success. Here from some that have had great success through blogging. Learn strategies and tactics. 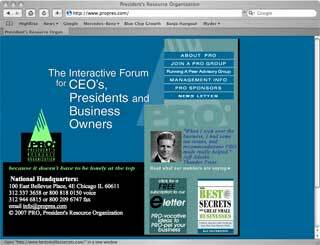 Business Blogging Pros welcomes Ray Silverstein and President's Resource Organization as our newset client. Ray is another 'Old Dog' like myself and definitely proves that old dogs can learn new tricks. Ray is the founder of Presidents Resource Organization, a nationwide network of peer group forums, where expert facilitators guide participants towards improved company and personal performance. PRO gives business owners an opportunity to present their problems, challenges, and opportunities in a confidential setting to others who have "been there, done that." Ray has wtitten a book, The Best Secrets of Great Small Businesses. Ray has also invented this cool device that anyone on crutches is probably dying to have. As the owner of a small but growing business, I know I m going to learn a lot from Ray's Blog. David Meerman Scott had a great post today in his blog Web Ink Now. He talks about how the 'new' ways of marketing and PR are really just a return to the way we did things prior to the advent of television. I like that analogy. We used to have neighborhoods. We all knew the corner grocer by first name and he knew everyone. He not only knew their names, he knew the names of their kids and what grade they were in school. He knew where we worked and where our spouses worked. And we all knew the same about him. As well as just about everyone else in the neighborhood. When someone was sick our down-and-out, the corner grocer knew it, helped out, and spread the word. Television, big box stores, and a bunch of other phenomenon came along and changed all that. Our traditional 'neighborhoods' were gone. Blogs have brought them back. Only now my neighborhood is global (with apologies to Shel Israel). 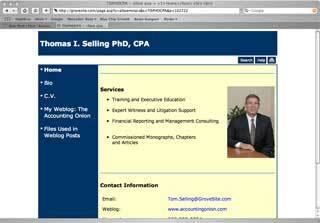 Business Blogginng Pros welcomes Tom Selling as our newest customer. Tom is an accountant, but a different breed of accountant. He has a way of explaining even the most mind-being topics - like Sarbanes-Oxley - in a simple way. Tom is also Founder and President of Grove Technologies, the people who offer that really cool collaboration platform GroveSite. I'm going to spend some more time with GroveSite because I think it would make a great platform for building your own social media site. Tom's blog is Accounting Onion and has already proven to be very interesting. Business Blogging Pros welcomes Blair Ballin and The Teddy Blair Team as our newest client. Blair's blog is The Rambling Realtor. 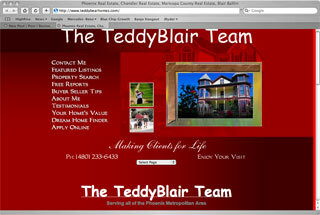 Blair is a realtor specializing in Phoenix reale estate. In the short time I've known Blair, I've learned several interesting things about him. For one, he lives in Phoenix's Coronado Historical DIstrict in a house he restored himself. Wow! Though Blair and I are both foodies, we inhabite different parts of the foodie spectrum. Blair likes to try new and different restaurants. Me? I like to cook. I really look forward to Blair's foodie posts. I am catching up on backlog of blog-reading and discovered that a couple weeks ago Shel Israel said something pretty profound. It was in the larger context of a discussion about whether or not blogging is becoming passe. The blogs are not the revolution. Conversation is the revolution, and the tools for online conversation keep getting better and more diverse and that is how it should be. 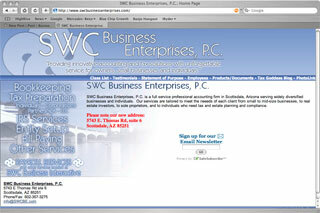 Business Blogging Pros welcomes Shauna Wekherlien and SWC Business Enterprises, PC. as our newest client. Make no mistake, Shauna is The Tax Goddess. Shauna is also my accountant. I spent an hour with her a couple of weeks ago and I have never in my life seen someone so passionate about taxes, accounting, and bookkeeping. Evryquestion I had, she had a simple, understandable, yet comprehensive answer for. Shauna is brilliant.